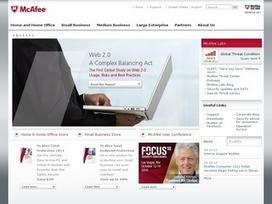 Founded in 1987 by the Intel Corporation, McAfee is the world's leading dedicated online security company. They are a company committed to helping their customers remain safe and they accomplish this goal by developing and implementing secure solutions for the digital world. McAfee's software is built to guarantee their customers' Mac or PC laptop, android smartphone or tablet is safe from viral attacks. McAfee knows that so much of the customers' online activity happens while they are on the go, so not only do they offer superior protection for your mobile devices, but their software also includes the capability of locating lost and/or stolen devices and innovative technology that guard against identity theft thus keeping your financial and other personal information safe. Products such as the Global Threat Intelligence are able to track potential threats, which enables McAfee to stay ahead of the curve when it comes to outsmarting hackers and other threats to your online privacy and safety. McAfee has something for every customer depending upon their specific needs. For complete virus protection and Internet security they offer the McAfee All Access. With this software package customers can protect all of their devices as well as all of their documents and files. The All Access software is relentless in its dedication to making sure your digital devices are secure. This is a complete antispyware, antivirus, and antiphishing program which scans, blocks, and identifies threats such as malicious spyware, Trojans and rootkits. With its two-way firewall, cybercriminals will be unable to access your Mac when the customer is online. For users who shop online, McAfee uses (color-coded) icons in order to identify whether a site found from a web search is safe to open or not. Using the content filtering options, users are able to block up to 35 different categories of potential offensive websites and filter inappropriate content online from sites such as YouTube or iTunes. In addition, for the PC user McAfee offers much more. Here are just a few of the many benefits you will enjoy with McAfee: Encrypted Storage with password protection, Wireless Network protection from hackers and other data thieves, and their exclusive cutting-edge anti-bot protection which prevents your computer from sharing personal information to criminals via internet crime networks known as botnets. Parents love McAfee's activity reports. This online activity monitor details the activities of minor children then advises parents about where they have been online, what they have viewed and even the content of their instant messaging conversations. With this software parents can even set time limits on a specific computer's usage, all by following quick, easy and user-friendly instructions. If you have ever lost data or infected your computer due to an infected USB or portable device, you will love the USB and removable drive scan feature. This software program automatically scans and blocks connected storage devices or drives and identifies and disallows access for those that are infected with harmful Trojans, viruses or worms. McAfee works hard for customers even if their computer is already infected. The software does a preinstall scan that will not only help recover the system, but will remove any threats or infections as it installs. McAfee is a world-class security software product dedicated to ensuring customers receive the best and most secure protection available. Share what you think about McAfee, and your favorite ways to save there!